Meta-analysis of archaeozoological data from 28 prehistoric sites in Thailand and Peninsular Malaysia indicate that turtle (hard-shell, soft-shell and tortoise) and mollusc exploitation dominate the late Pleistocene and Holocene hunter-gatherer record. A total of 163 taxonomic classifications provide 29,842 identified specimens in this dataset. Using nestedness and squared chord distance metrics, results indicate that narrowing diet breadth and similar faunal composition is broadly characteristic of this region through time. A historical review of recording techniques indicates that while minimum number of individual (MNI) faunal quantification remained abundant during the twentieth century, number of identified specimen (NISP) quantification is more prevalent today. Synthesis of taxonomic composition suggests that Peninsular Malaysian sites have a higher abundance of wild boar (Suidae) in relation to Thailand sites that have a higher abundance of deer (Cervidae). Turtles and molluscs appear at almost every site in relative high occurrence and abundance. Future archaeozoological research should focus on standardizing quantification techniques, and providing fine-grained identification of turtle specimens to more accurately investigate shifting subsistence strategies, paleoenvironmental change, and seasonal occupation of sites throughout mainland Southeast Asia during the Pleistocene and Holocene. Meta-analyses of archaeozoological data provide explanations of fine-grained questions using large databases (Conolly et al. 2011; Cranbrook and Piper 2009; Emery 2007; Grayson and Meltzer 2002; Grayson 2005; Rick et al. 2011). A classic example of a meta-analysis is the recognition that we only have evidence for Clovis-era hunter-gatherers in North America exploiting two of the 35 large mammal genera that became extinct during the late Pleistocene (Grayson and Meltzer 2002). Meta-analyses of faunal data provide (i) quantifiable means to test hypotheses about regional or cultural adaptations; (ii) an understanding of the composition and state of a regionally-geographically specific eco/arti-factual database; and (iii) information on shifting patterns in the archaeological record through time. In Southeast Asia, broad syntheses of different eco/arti-fact classes have shed light on topics as diverse as prehistoric landscape modification and forest disturbance (Hunt and Rabett 2014), geographical distribution of rice production and consumption (Castillo 2011; Castillo and Fuller 2010), and historic trends in the methodological and conceptual analysis of flaked stone artifacts (Marwick 2007). Aside from qualitative syntheses of Southeast Asian faunas (Gorman 1971b), little archaeozoological meta-analysis has occurred in this region. Identifying subsistence change at the Pleistocene-Holocene transition is a popular topic in archaeozoological endeavors (Conolly et al. 2011; Stiner and Munro 2002; Zeder 2012). This transition is significant during human prehistory because of worldwide climatic change that transpired, away from a glacial period into the climatic and environmental regime that we see today (Straus et al. 1996). In mainland Southeast Asia, this transition is significant but few meta-analyses attempt to understand the inherent subsistence changes that may have emerged (cf. Rabett 2012). In this paper I conduct a compositional overview of the late Pleistocene and Holocene archaeozoological record in Thailand and Peninsular Malaysia to establish the methodological and quantitative patterns found within this large faunal dataset. I then use nestedness and squared chord distance metrics to explore shifting faunal exploitation in Thai-Malay assemblages spanning the Pleistocene-Holocene transition. The primary goal of this analysis is to examine trends in forager subsistence activity in Thailand and Peninsular Malaysia, thus this sample is limited to a total of 28 sites within both regions that span the late Pleistocene to Holocene and have archaeozoological deposits that are primarily pre-agricultural in nature (Figure 1; Table 1). I use the presence of ceramics as a coarse proxy for agriculture. There are two important caveats to this. Location of sites discussed in text. (1) Spirit Cave, Banyan Valley Cave, Tham Phaa Can (2) Tham Lod Rockshelter, Ban Rai Rockshelter (3) Ban Chiang (4) Non Nok Tha (5) Sai-Yok Rockshelter (6) Khao Talu Cave, Heap Cave, Ment Cave (7) Lang Kamnan Rockshelter (8) Nong Nor (9) Pak Om Cave (10) Buang Beab Cave (11) Lang Rongrien Rockshelter, Khao Toh Chong Rockshelter, Moh Khiew Cave I, Moh Khiew Cave II (12) Sakai Cave (13) Thung Nong Nien Rockshelter, La Sawang Rockshelter (14) Gua Kepah (15) Gua Gunung Runtuh, Gua Harimau, Gua Ngaum, Gua Teluk Kelwar (16) Gua Peraling, Gua Chawas, Gua Cha (17) Seberang Perak (18) Gua Tenggek, Gua Sagu (19) Gua Kechil. Archaeological sites, locations, methods of faunal recording, available date ranges and key references for Thai-Malay sites. This table uses published radiocarbon dates, including mollusk dates (Bulbeck 2014), as such; the dates reported here should not be regarded as an absolute chronological range. Instead these dates act as a coarse date range. For each site, see cited literature for exact chronological details. * = Represents publications where faunal data is extracted. First, many of the reported radiocarbon dates for these sites come from uncontrolled deposits (not in stratigraphic association), or from material (molluscs) that have uncorrected dates which do not account for reservoir effects or diagenetic processes (Bulbeck 2014). Second, while I am primarily interested in forager subsistence strategies, several of the sites span the Neolithic transition into the Protohistoric period. Commonly included in these later Holocene assemblages are increased ceramic accumulations and adzes, both suggesting a sedentary agricultural adaptation. At Khao Toh Chong Rockshelter, these artifact classes increase rapidly in abundance after 7,000 years ago (Van Vlack 2014). Thus, it is difficult to tell when faunal remains were deposited due to mobile hunter-gatherer groups or agriculturalists in nearby settlements. I do not attempt to dichotomize faunal data to differentiate these groups (although this would be a worthwhile and interesting endeavor in the future). Instead, I simply use all available data during the span of these sites and assume that hunter-gatherer groups are the primary accumulating agents. For this reason, I specifically exclude sites and faunal data from known settlement agricultural sites (generally open sites in flood plain valleys). Some well-documented examples of these include Ban Chiang and Non Nok Tha (Higham 1977; Higham and Kijngam 1979). Assemblages chosen for this analysis span the late Pleistocene through the Holocene, approximately 45,000 years ago to the present, in Thailand and Peninsular Malaysia (Table 1; Figure 1). With the exception of the Guar Kepah (GK) and Sebarang Perak (SP) shellmounds in Peninsular Malaysia (Bellwood 2007), all sites are either caves or rockshelters. This provides the ability to understand stratigraphic and chronological sequences of faunal exploitation and subsistence activities over long temporal spans (Anderson 1989; Anderson 1997; Anderson 2005; Straus 1990; Straus 1979), but also may indicate that site type bias is occurring in this region (Higham 2013). Aside from similar chronologies and site types, these sites also share characteristics in their lithic techno-complex assemblages. Cave and rockshelter sites in Thailand and Peninsular Malaysia dating to the late Pleistocene and Holocene often contain deposits described as Hoabinhian (Bronson and White 1992; Dunn 1970; Forestier et al. 2015; Gorman 1972; Marwick 2007; Matthews 1966; Reynolds 1990; Shoocongdej 2000; Tan 1997; White and Gorman 2004), a term variously used to document a lithic technology, temporal period, subsistence economy and/or ethnicity (Marwick 2007). Recent research on the lithic assemblages from Tham Lod (TL) and Ban Rai (BR) in northwest Thailand show that paleoenvironmental processes drove considerable variability in the procurement strategies and technological adaptations of so-called Hoabinhian foragers (Marwick 2013). Some archaeologists thus avoid the term Hoabinhian to describe general archaeological periods, ethnicities or economies and instead explicitly use the term for conveying information on a distinct artifact typology (i.e., Sumatraliths) with formal characteristics (Shoocongdej 2000). All 28 sites reviewed for this work date to the late Pleistocene or Holocene and have some Hoabinhian type material within their deposits. I also chose the 28 sites in this review based on availability of published or gray literature. Excluded sites include Buang Baeb and Pak Om Rockshelters, which both have large faunal assemblages, but are recorded in Thai language reports only (Reynolds 1990; Shoocongdej 1996a; Pers. comm. Cholawit Thongcharoenchaikit 2014). In addition, data from the Peninsular Malaysian sites, Gua Harimau (GH), Gua Ngaum (GN) and Gua Teluk Kelawar (GTK) are extracted from Bulbeck (2003). The 28 sites included here represent some of the best evidence for prehistoric hunter-gatherer occupations in mainland Southeast Asia (see previous syntheses by Adi 2007; Shoocongdej 1996a), and are historically used in other reviews of archaeological material from this region (Marwick 2007; Reynolds 1990; Shoocongdej 1996a; Shoocongdej 2000). There is a considerable literature on the benefits and potential bias derived from using NISP versus MNI quantification in vertebrate faunal studies (see Lyman 2008 for overview). Since this is a meta-analysis, I am limited by counts of taxonomic abundance provided in the published or gray literature. Here, I focus on summarizing NISP counts to limit any additional biases created by aggregating MNI values from sites. Separate quantification issues occur when counting the taxonomic abundance of invertebrate faunas (Claassen 1998). I do not quantify invertebrate faunas from these 28 sites, due to dissimilar recording techniques, and thus my investigation of these issues is limited. Additionally, there is inconsistency on screen size use (or reporting sieving methods) in the archaeozoological literature from this region. While some excavations used small-sized screens (e.g., Gorman 1971b), others lack published screen size information. It is possible that several animal types, including fish, birds, small mammals and small reptiles, are absent from this faunal dataset due to screen size biases (see Nagaoka 1994; Nagaoka 2005; Quitmyer 2004 for examples). Non-human accumulation of faunal material represents another potential bias in this dataset. I am unaware of any robust taphonomic analyses in mainland Southeast Asian archaeozoological contexts (see Forestier et al. 2015 for a recent application), but some discussion of these issues occurs in island Southeast Asia literature (Stimpson 2009; Stimpson 2012). Rodents, raptors, mammalian carnivores and some reptilian carnivores could potentially accumulate faunal remains in cave and rockshelter sites, independent of human activity (Blumenschine 1988; Faith 2013; Lyman 1994; Schmitt and Lupo 1995), but analyses focused on this topic in Southeast Asia are lacking. Furthermore, some fauna from these 28 sites likely accumulated through natural death events, specifically bat species (Higham 1972; Rabett et al. 2011). There is a tendency in Southeast Asian archaeozoology to assume that all fauna in cave and rockshelter sites accumulated through human activity. Without re-investigation of faunal assemblages focused on taphonomic processes, it is difficult to determine which taxa from these sites truly reflect human subsistence strategies. I expect that the signal of human subsistence activity should be clearly represented in this analysis based on large abundances of specific prey types that were consumed throughout the late Pleistocene and Holocene in this region. As such, I do not discard any faunal data in this research, even though it was potentially accumulated through non-anthropogenic means. Seasonal bias in human occupation of cave and rockshelter sites is an additional potential limitation in this analysis. Interestingly, this question remains relatively unanswered during this temporal period. Based upon the association of wet and dry season resources (freshwater gastropods and bivalves) in the same stratigraphic contexts at Spirit Cave (SC) in northwest Thailand, Gorman (1971a; 1971b; 1972) argued that this represented year-round site occupation by hunter-gatherer groups. Yet, more recent research at Lang Kamnan Cave (LK) in central Thailand suggests that only a wet season occupation is represented in the assemblage based upon the presence of botanical and land snail remains (Shoocongdej 1996b; Shoocongdej 2000). At Lang Rongrien Rockshelter (LR) in southern Thailand, faunal data suggests that the site was intermittently occupied during the late Pleistocene and Holocene, in both the wet and dry seasons (Anderson 1990; Anderson 2005; Mudar and Anderson 2007). Clearly, additional research is required before identifying site-specific seasonal occupations in mainland Southeast Asia. Typically, only the qualitative association of wet and dry season resources in cave and rockshelter sites is used to determine seasonal occupation events. These resources are useful as paleoecological proxies for seasonality, but depositional resolution of cultural activity remains low. Archaeozoologists in mainland Southeast Asia must develop new techniques to identify what is likely low intensity, short occupation, seasonal events in sites. Micromorphology of sediments to examine micro-stratigraphic layers and geochemical analyses of fauna may be useful techniques in this regard. Finally, some prehistoric sites in mainland Southeast Asia may represent specialist activities. Two notable possibilities are Tham Phaa Can (Steep Cliff Cave) and Nong Nor. Tham Phaa Can does not have an identified and published faunal assemblage, only a descriptive account remains (Higham 1989). Still, this account suggests that large artiodactyls and turtles or tortoises dominate the assemblage. Similarly, Nong Nor is dominated by approximately 5.5 million common orient clams (Meretrix lusoria), indicating that hunter-gatherer groups with a marine adaptation intensively exploited resources at this site (Higham and Thosarat 1998). There is little evidence for specialist subsistence strategies at other sites in Thailand and Peninsular Malaysia. Since the faunal assemblage is not quantified from Tham Phaa Can, any potential bias is limited from this site and it is included here. Nong Nor is excluded due to the considerable specialist activity represented in the assemblage. Although some bias is present in Thailand and Peninsular Malaysian faunas, specifically non-human accumulation of remains and seasonal occupation events, the nuances of these processes remain unknown. Thus, I include all sites and faunal data (except for Nong Nor) to investigate shifts in methodological techniques, faunal composition, and changing subsistence strategies during the late Pleistocene and Holocene. First, I aggregate all faunal publications by decade to explore how archaeozoological research emerged during the twentieth and twenty-first centuries. Decadal divisions of quantitative units employed by Southeast Asian archaeozoologists provide insight into the shifting methodological techniques used in this same period. Thai-Malay faunal research has its own discrete temporal and methodological qualities that are expressed by these analyses. Next, I separate all identified Thai-Malay fauna into total NISP counts per taxonomic classification. By examining Thai sites and Peninsular Malay sites alone, differences and similarities between geographic regions, dominant faunas and total abundances appear. All numerical and taxonomic data employed in this research is available as supplemental information in the University of New Mexico digital electronic repository, including source code for analyses conducted in R (3.1.1) and RStudio (0.98.1028) (Conrad 2015; http://hdl.handle.net/1928/25699). I use nestedness analysis to explore change in composition of these faunas through time. Nestedness uses a presence-absence matrix to establish whether faunas within a set are subsets of each other (Atmar and Patterson 1993; Jones 2004; Jones 2015; Lyman 2008; Patterson 1990; Staniczenko, Kopp and Allesina 2013). As an ecological metric, nestedness is important because it allows inference into how random or non-random a faunal assemblage is, and is thus useful in studies of culturally accumulated remains (Kougioumoutzis, Simaiakis and Tiniakou 2014; Simaiakis and Strona 2014). Originally created to deal with species level extinctions, nestedness provides a quantitative means to test if the diversity of species is broadening or narrowing through time, or across space, when coupled with analysis of changing species richness (NTAXA) (Atmar and Patterson 1993; Patterson 1990). By quantifying the degree to which species enter and leave a population (e.g., island biotas), nestedness provides a value to measure the degree to which local extinction and colonization occurs. A benefit of nestedness analyses in archaeozoological research is that quantitative units in the original literature can easily be transformed into presence-absence matrices, even to the level of basic description. While methods of quantifying nestedness have changed over time (Atmar and Patterson 1993; Patterson 1990), the basic principles remain. A perfectly nested assemblage occurs when successive populations have a perfect subset number of species in relation to the population prior (Atmar and Patterson 1993; Jones 2004; Jones 2013; Jones 2015). Using the open-source software NeD (Strona et al. 2014), I calculate NODF (nested overlap and decreasing fill; Almeida-Neto and Ulrich 2011; Guimarães Jr. and Guimarães 2006) and T (nestedness temperature; Atmar and Patterson 1993; Guimarães Jr. and Guimarães 2006). When a perfectly nested order is calculated the NODF = 100 while T = 0. A perfectly random and non-nested assemblage exhibits a NODF = 0 and T = 100 (Almeida-Neto, Guimarães Jr. and Lewinsohn 2007; Almeida-Neto et al. 2008; Atmar and Patterson 1993; Jones 2015; Ulrich, Almeida-Neto and Gotelli 2009). NeD quantifies z-scores and gives a significance value based upon 500 simulated null matrices using the ‘CE’ (proportional row and column totals) algorithm (Bascompte et al. 2003; Jones 2015). SC, Banyan Valley (BVC), TL, Khao Talu (KT), Ment (MC), LK, Sai Yok (SY), LR, Khao Toh Chong (KTC), MKI, and Sakai (SK) are quantified with nestedness metrics. Here, I use squared chord distance analysis to understand similarity in faunas through time. Squared chord distance analyses (otherwise known as dissimilarity coefficients) originated in the ecological literature describing the similarity between biological assemblages (Gavin et al. 2003; Overpeck, Webb III and Prentice 1985). Known as signal-to-noise matrices, squared chord distance uses the weighted percentage of variables (fauna) as a “signal” of similarity (Gavin et al. 2003; Overpeck, Webb III and Prentice 1985). By quantifying faunal classes as a weighted percentage, an emphasis on the relative proportion of each taxonomic class or species relative to all others (but not to their absolute values) gives squared chord distance its uniqueness as a broadly applicable measurement (Ludwig and Reynolds 1988). This metric produces a value between 0–2, with 0 representing a perfectly similar assemblage based on taxonomic composition between two successive pairs of assemblages or stratigraphic contexts (Faith and O’Connell 2011; Ludwig and Reynolds 1988). Regardless of how fauna is reported, given that the same reporting technique is used for the complete assemblage (or compared contexts), squared chord distance is applicable. Archaeozoological application of squared chord distance is limited, but Faith and colleagues successfully express its quantitative value for faunal assemblages (2013; Faith and O’Connell 2011). By using squared chord distance analyses, rapid shifts in paleoenvironmental conditions negatively impact small mammals by increasing turnover and community fragmentation in southwestern Australia during the Pleistocene, prior to human mediated impacts (Faith and O’Connell 2011). Taphonomic and paleoecological investigations of Middle and Later Stone Age deposits in the Cape Floristic Region of South Africa show similar results (Faith 2013). Here, shifts in taxonomic composition are not correlated with taphonomic processes when quantified using chord distance (Faith 2013). In Thai-Malay sites, fauna is recorded differentially as NISP or MNI counts, and squared chord distance provides a proxy measure to understand similarity in taxonomic composition through time between sites with contrastingly recorded quantitative units. 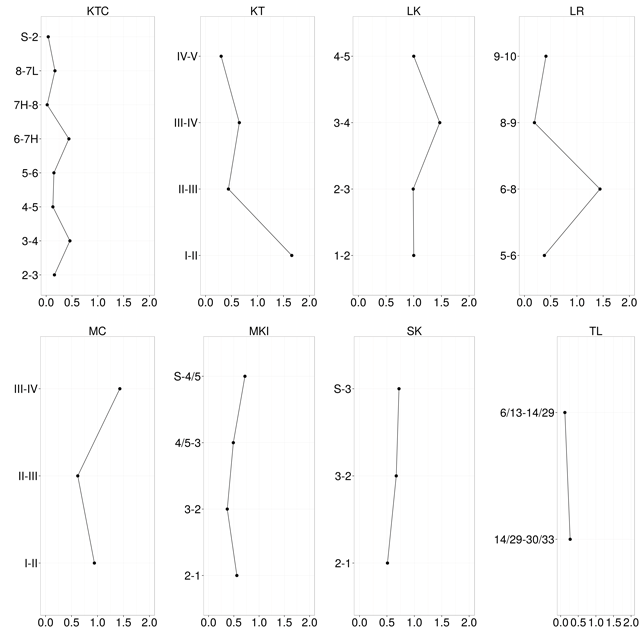 Squared chord distance is quantified for the following sites – TL, KT, MC, LK, LR, KTC, MKI, SK – between successive stratigraphic contexts in each assemblage. The Thai-Malay archaeofaunal record is abundant and diverse. At least 163 distinct taxonomic classifications are represented in Thailand and Peninsular Malaysian archaeological sites with a total NISP of 29,842 (Tables 1 and 2; Appendix 1 Table A), but this number is only a minimum because of the number of publications (in Thai or Malay) that I am unable to access. As a whole, molluscs (bivalves and gastropods) appear most frequently in sites followed closely by sambar deer (C. unicolor), hard-shell and soft-shell turtles and tortoises (Testudines), Indian muntjac deer (M. muntjak), and wild boar (S. scrofa). Due to scattered recording techniques applied to molluscan assemblages, their analytical value in this study is low and they are not explored in greater detail (Table 2). Thailand and Peninsular Malaysia have a comparable division of faunal publications using different recording techniques (Table 3), but their use through time has shifted. 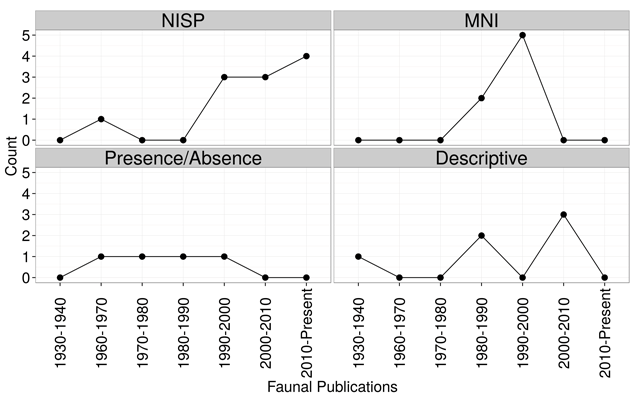 Until the 1990s and later, MNI, presence/absence, and descriptive publication styles were popular, but during this decade and after NISP became the dominant technique employed (Figure 2). Methodological recording of molluscan fauna from Thai-Malay sites. Unknown indicates that mollusc data could not be identified in the site literature. Present indicates that a passing note of molluscan presence is provided for the site, but no absolute counts. Raw count is molluscan data that is aggregated into broad categories, for example shellfish or mollusc, and recorded in the literature. Taxonomic summary of Thailand and Peninsular Malaysian faunal data. Total count of Thailand and Peninsular Malaysia sites with differential faunal recording methodologies. Decadal division of faunal publications using differential methodological recording techniques during the 1930s–2010s. Archaeofauna identified in this meta-analysis occupy a mosaic of environments, including savannah grasslands, open forests, dense jungles, riparian, lakes, marsh/estuaries, and marine habitats. A full range of size classifications are also represented in this collection, from large sized elephants to small sized mice, rats, and bats. Clearly, select species (and habitats) were exploited more intensely than others throughout this region. Large abundances of turtles, tortoises, deer and pigs indicate that both aquatic and terrestrial species were consumed. When comparing NISP counts between Thailand faunal classifications, several trends appear (Figure 3). Testudines clearly dominate the fauna with over 14,000 identified specimens, with the next closest classes being monitor lizards (Varanidae) and deer (Cervidae), but this regional trend is primarily driven by the dominance of Testudines from Moh Khiew Cave II (MKII). When MKII is removed deer have the highest NISP values, with Testudines only behind by a small factor (Figure 4). Furthermore, when Testudines are removed primates, deer and monitor lizards are more evenly distributed and all share relatively high NISP values (Figure 5). 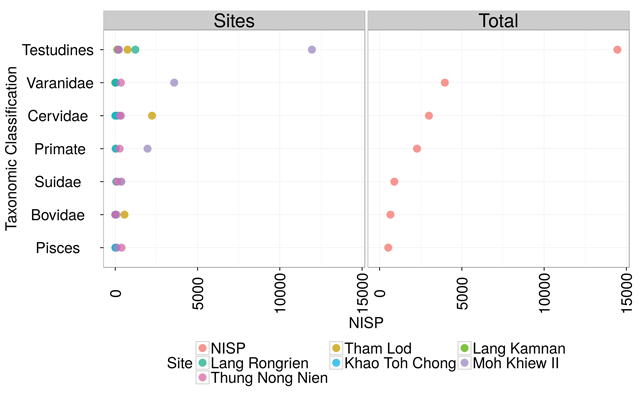 Grouped classifications from Thailand sites expressing total NISP counts per site (left column), and total NISP counts for all sites (right column). 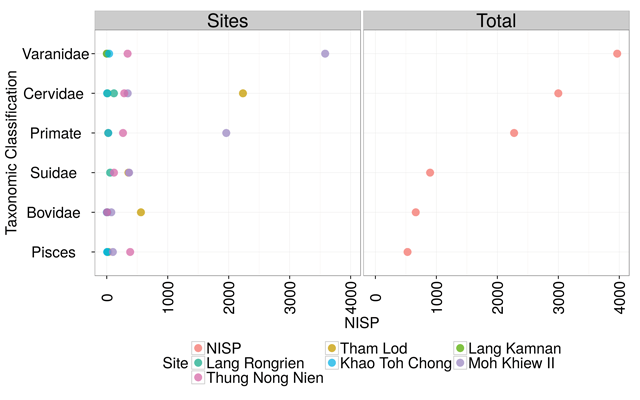 Grouped classifications from Thailand sites expressing total NISP counts per site (left column), and total NISP counts for all sites (right column) without Moh Khiew Cave II. 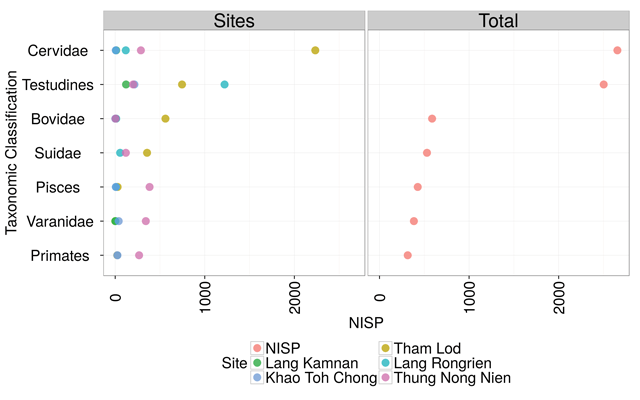 Grouped classifications from Thailand sites expressing total NISP counts per site (left column), and total NISP counts for all sites (right column) without Testudines. Peninsular Malaysian sites show a slightly different trend. Here, NISP values are substantially lower than Thai sites and thus the spread between sites and classes is considerably less. Instead of deer displaying high NISP values, wild boar, and Testudines tie for the top NISP counts, both with 212 (Figure 6). A surprising transition in the Peninsular Malaysian data is the lower abundance of deer compared to other classes. Deer appear in less abundance than primates, birds and fish in this region. The significance of this change is discussed below. Grouped classifications from Peninsular Malaysian sites expressing total NISP counts per site (left column), and total NISP counts for all sites (right column). Nestedness values suggest that during the late Pleistocene and Holocene, hunter-gatherer subsistence strategies were variable, but clearly influenced by archaeozoological investigator bias (Table 4). Only sites with NISP recording have significantly nested faunas. At SC a nested fauna appears without being identified as NISP values, but this is potentially due to the high degree of documentation provided by both Gorman (1971b) and Higham (1977). MKI is also nested, but less strongly, only the T metric is significant. These data suggest that differing levels of methodological recording and analysis are driving the nested or non-nested state of faunal assemblages. Nestedness results for Thailand faunal assemblages, and NTAXA data for significantly nested faunas. NODF = 100 in a perfectly nested assemblage/NODF = 0 in a non-nested assemblage. T = 0 is a perfectly nested assemblage/T = 100 in a non-nested assemblage. * = Significant at the 95% level or greater. It is intriguing that the spread of nestedness values is much higher in northern Thailand than in peninsular Thailand. This may be a result of several factors, but comparable nestedness for LR, KTC, and MKI indicate that faunal accumulation occurred similarly at these sites throughout the late Pleistocene and Holocene. These patterns are potentially related to the limits of hunter-gatherer mobility on the Peninsula, prey type diversity or habitat fragmentation throughout the Pleistocene-Holocene transition. In general, when sites are quantified by NISP values, nested assemblages occur through time. This may be indicative of a large-scale pattern involving narrowing diets over the course of the Holocene, or site-level bias based on archaeozoological quantification techniques (i.e., identification of a limited number of skeletal elements is skewing the true species diversity). Squared chord distance results provide a slightly more complex story of faunal similarity and dissimilarity through time (Figure 7). While several sites have a remarkably similar taxonomic composition in successive contexts (TL, KTC, MKI, SK), others show increased dissimilarity over time (KT, MC, LK, LR). Interestingly, the sites with similar taxonomic composition through the late Pleistocene and Holocene are located in peninsular Thailand (except for TL in both region and time). Lang Rongrien has a dramatic change in faunal composition, but this is potentially driven by the rigorous reanalysis of only the Pleistocene faunas at the site (Mudar and Anderson 2007). Squared chord distance values for Thailand and Peninsular Malaysian sites. S = Surface context. In general, the changes in recording methodology and quantitative units employed by mainland Southeast Asian archaeozoologists working in Thailand and Peninsular Malaysia throughout the twentieth and twenty-first centuries have followed similar patterns globally during this time (Lyman 2008; Lyman available from the author). The popularity of MNI as an archaeozoological recording technique reached its prime during the 1960s–1980s because faunal analysts felt that it provided a more accurate measure of taxonomic abundance, skeletal part frequencies, and meat weight estimation (Lyman available from the author). Based on the recording methodology employed by Thai-Malay archaeozoologists, MNI reached its peak during the 1980s-1990s before dropping off in relationship to NISP. This upward trend in analytical recording of NISP in Thai-Malay assemblages allows for continued, and future, statistical analyses of Southeast Asia faunal assemblages and a more rigorous understanding of the true nature of the archaeozoological record (diversity/richness) in this region (cf. Lyman 2008: 172–213). Furthermore, based upon the dissimilar recording of molluscan taxonomic abundance, Southeast Asian archaeozoologists should attempt to standardize quantification techniques. Documentation of NISP, MNI and weight values for all invertebrates will enhance the ability to quantitatively examine shifts in invertebrate composition and diversity through time (Claassen 1998; Giovas 2009; Mason, Peterson and Tiffany 1998). Occurrence and NISP counts for Thai-Peninsular Malay Pleistocene-Holocene sites indicate that while large sized prey types are common, and were consumed by hunter-gatherers, small sized prey types, which are often slow moving or immobile, tend to occur most frequently in faunal assemblages. Mainland Southeast Asia supports an extremely diverse and rich array of mollusc, turtle and tortoise species (Dudgeon 2000; Köhler et al. 2012; Thirakhupt and van Dijk 1994; Turtle Taxonomy Working Group 2014). While previous work begins to examine the role that these animals played in prehistoric forager subsistence strategies in this region (Conrad in press; Mudar and Anderson 2007; Pritchard, Rabett and Piper 2009; Rabett 2012; Van Vlack 2014), this overview establishes their importance in the Pleistocene and Holocene diet of Thai-Malay foragers. These animals not only provide a wealth of information on prehistoric subsistence strategies, but they also have the potential to be used as proxy evidence for paleoecological and paleoenvironmental shifts. Additionally, Testudines and Mollusca commonly occupy a niche habitat, stagnant and slow-moving freshwater environments, where wet-rice cultivation and horticulture is possible (Van Vlack 2014). By better identifying the prehistoric exploitation of these animals, it furthers our insights into exactly how, and when, the replacement of wild resources for domestic emerged in mainland Southeast Asia. Currently, archaeobotanical and genetic evidence suggests that rice and millet agriculture entered Southeast Asia through human migration from China during the mid-Holocene (Castillo 2011; Fuller 2011; Fuller et al. 2011; Gross & Zhao 2014; Higham 1996; Londo et al. 2006). Yet, understanding how subsistence adaptations shifted for indigenous hunter-gatherer groups in mainland Southeast Asia during the emergence of agriculture remains weak. Future analysis should attempt to standardize and gain robust taxonomic identifications for Testudines and Mollusca specimens to better understand shifts in their species richness, diversity and composition through time (e.g., Pritchard, Rabett and Piper 2009). Originally, this research focused on using a meta-analysis of faunal data to understand historical methodologies and Pleistocene-Holocene subsistence strategies from mainland Southeast Asia. By exploring the true nature of these data it appears that broad-scale patterns may not necessarily characterize this region; instead, localized trends emerge. What results do suggest is that prehistoric hunter-gatherer groups consumed a large abundance of turtles, deer, monitor lizards, primates and wild boar, but to varying degrees of intensity. In Thailand, turtle exploitation is dominant, but MKII clearly saturates the record. Overall, Thailand assemblages appear to be driven by the extraordinary level of high precision identification, recording and quantification of the faunas from MKII and TNN (Auetrakulvit 2004a). Without these NISP counts, the faunal record is skewed towards deer as the dominant species exploited in the past. This suggests that with future archaeozoological research, the character of the faunal data from Thailand may change once additional assemblages are recorded, and previously excavated assemblages are reanalyzed with modern techniques. The breadth of taxonomic classifications identified by archaeozoologists working in Thailand and Peninsular Malaysia also suggests that both human and non-human agents are accumulating fauna in cave and rockshelter sites. While naturally high levels of endemic faunal diversity suggests that hunter-gatherer groups had access to a wide range of potential prey types (Charoenwongsa 1987), this does not necessarily mean that hunter-gatherers always exploited a broad diversity of resources. This meta-analysis indicates that species-specific exploitation is common throughout the late Pleistocene and Holocene. One striking aspect of this dataset is the difference in abundance between deer and wild boar in Thailand and Peninsular Malaysia. Although an unexpected result, this information is useful both for understanding paleoecology, and as a prediction of the types of prey that may be identified in Peninsular Malaysian versus Thailand sites. Further research is required to understand the exact processes of this difference, but using modern ecological knowledge as a predictive framework, the dominance of wild boar in Peninsular Malaysia may be a reflection of more suitable habitat availability for this species and thus higher population densities. Wild boar tends to enjoy dense tropical forest vegetation in contrast to larger sized cervids that occupy transitional and marginal zones at the edges of forest-grassland habitats (Francis 2008; Lekagul and McNeely 1977). If these predictions are an accurate reflection of these species’ paleoecology, then tracing the relationship of deer to wild boar through the Pleistocene and Holocene in mainland Southeast Asia could be used as a proxy for shifting environmental conditions and habitat type exploitation. This is the type of predictability and hypothesis construction that meta-analyses, like this one, bring to the archaeozoological record in Southeast Asia. Nestedness and squared chord distance results suggest that there may be differences occurring in the accumulation and exploitation of species between northern Thailand and the Thai-Malay peninsula. Similarity in both faunal composition and NODF values in southern Thailand indicates that hunter-gatherer groups shared a common foraging strategy during the late Pleistocene and Holocene. Why these similarities exist are currently unknown, but the substantial increase in sea levels and loss of landmass at the end of the Pleistocene on the Thai-Malay Peninsula are likely to be significant drivers of these results (Anderson 1990; Dunn and Dunn 1977; Horton et al. 2005; Sathiamurthy and Voris 2006; Scheffers et al. 2012; Sinsakul 1992; Tjia 1996; Voris 2000). Lowered hunter-gatherer mobility or lower human population densities during this period may have allowed groups to exploit a similar and consistent prey base over time. While the results of nestedness and squared chord distance analyses describe coarse trends in the Thai-Malay faunal record, the more direct utility of these methods is their application for assemblages recorded with diverse techniques (NISP/MNI/Presence-Absence). In Southeast Asia, a region with a rich history of archaeological investigation spanning the past 150 years or more, quantitative techniques like nestedness and squared chord distance provide the ability to compare sites with diverse and distinct assemblages that utilize older quantitative methodologies. Nestedness also suggests that methods of identification are potentially driving quantifiable patterns in these assemblages. Due to the nature of fragmentation and poor preservation in Southeast Asian faunal assemblages, archaeozoologists typically only identify teeth because of their robustness and preservation (Wattanapitaksakul 2006). Thus, faunal data likely lacks the complete suite of diversity present, providing a potential driver of these nestedness results. Overall, the Thailand and Peninsular Malaysian archaeozoological record is robust and unique in its diversity and abundance. Continued faunal research in this region will only clarify and expand the results, questions, and themes presented in this analysis. It is also my hope that this overview and synthesis of faunal data provides a useful guide for future research and hypothesis testing in mainland Southeast Asia. Meta-analysis of Thailand and Peninsular Malaysian faunal assemblages establishes the current state, and patterns present, in the archaeozoological records from 28 sites in this region. Small sized slowly moving fauna (mollucs, turtles and tortoises) dominate the occurrence and NISP counts, but further research is needed to establish firm taxonomic identifications and standardization of recording methodology. These results are important for future hypothesis based research investigations. For example, why do wild boar appear in greater abundance in Peninsular Malaysia than Thailand? Are similar foraging economies occurring in southern Thailand during the Pleistocene-Holocene transition, driving the similarity in nestedness and squared chord distance results? Finally, how does the exploitation and consumption of turtles and molluscs relate to the onset and transition to agriculture and domestication? These types of questions are extremely significant to the archaeological record in this region, and archaeozoological data increases our ability to answer them. Finally, while this meta-analysis focused on Thailand and Peninsular Malaysia, the records of Myanmar, southern China, Laos, Cambodia, Vietnam, Island Malaysia and beyond, have the potential to provide substantial insights into broader trends through greater Southeast Asia. The exploitation of turtles and molluscs clearly extends into the deep past and continued research should focus on understanding their exploitation, consumption, and ecological histories in Southeast Asia. This appendix includes a complete taxonomic list of animals identified and recorded from all 28 archaeological sites reviewed for this meta-analysis in Thailand and Peninsular Malaysia. Occurrence is defined as the number of times (or counts) each classification occurs and NISP is defined as the total count of remains for each classification. If NISP counts are not available, the column is left blank. I exclude unidentified specimens from this summary (e.g., unidentified mammal). ‘Site Specific Taxonomic Classifications’ are extracted from the literature and are only corrected when spelling errors occur. Where taxonomic classifications have changed, superscript notes are placed and the updated current classification is recorded as follows – I: Galeopterus variegatus II: Trachypithecus obscurus III: Trachypithecus cristatus IV: Prionailurus bengalensis V: Prionailurus viverrinus VI: UNKNOWN VII: Rucervus eldii VIII: Rusa unicolor IX: Bos frontalis gaurus X: Insectivora taxonomy has changed to Scandentia and Soricomorpha XI-XII: Current taxonomic classification unknown XIII: Includes site classifications of “turtle”, “freshwater turtle” and “tortoise” – For consistency and simplicity, this research uses the original classifications from the literature (e.g. Cervus unicolor instead of Rusa unicolor). *–This is not a species of mouse deer. Based on geographic distribution, this classification is likely Tragulus kanchil, Tragulus williamsoni or Tragulus napu. My sincerest gratitude is extended to Rasmi Shoocongdej, Prasit Auetrakulvit, Cholawit Thongcharoenchaikit, Hannah Van Vlack, Pang Supalak, Un Chonma, Pekkie As, Anusorn Amphansri, Cherdsak Treerayapiwat, Bérénice Bellina-Pryce, Arnaud Filoux, Ryan Rabett, Colin Groves, Hitomi Hongo, and Erik Erhardt for sharing faunal data, literature and advice to me. Thank you as well to Tyler Faith for providing squared chord distance analytical advice, and David Bulbeck for offering archaeozoological data and an earlier review of this manuscript. I am continually grateful to Emily Jones and Ben Marwick for their mentorship, encouragement and earlier reviews of this research. I appreciate the revisions suggested by Kat Szabó and two anonymous reviewers; they helped to improve the presentation of this analysis. I also thank David Orton and James Morris for including a shortened version of this manuscript in their ‘Meta-Analysis’ session at the 12th ICAZ Conference, in September 2014. This research was partially funded by the Empowering Network for International Thai Studies, Institute of Thai Studies, Chulalongkorn University, with support from the Thailand Research Fund. Adi, H T (1983). Recent Archaeological Discoveries in Peninsular Malaysia 1976–1982. Journal of the Malaysian Branch of the Royal Asiatic Society 56(1): 47–63. Adi, H T (2007). Archaeology of Ulu Kelantan. Kuala Lumpur: Department of Museums Malaysia, Ministry of Culture, Arts and Heritage Malaysia. Amphansri, A (2011). Temporal and Spatial Analysis of Faunal Remains from Tham Lod Rockshelter Site, Pang Mapha District, Mae Hong Son Province. Unpublished thesis (MA). Silpakorn University. Anderson, D D (1989). Prehistoric Human Adaptations to Environments in Thailand In: Culture and Environment in Thailand: A Symposium of the Siam Society. Bangkok: The Siam Society. Anderson, D D (1990). Lang Rongrien Rockshelter: a Pleistocene, early Holocene archaeological site from Krabi, southwestern Thailand. Philadelphia: The University Museum. Anderson, D D (1997). Cave Archaeology in Southeast Asia. Geoarchaeology: An International Journal 12(6): 607–638. DOI: http://dx.doi.org/CCC 0883-6353/97/060607-32. Auetrakulvit, P (2004a). Faunes du Pléistocène final à l’Holocéne de Thaïlande: approche archéozoologique. Unpublished thesis (PhD). L#8217;Université Aix-Marseille I.
Auetrakulvit, P (2004b). Exploitation des petites faunes par les chasseurs collecteurs du sud de la Thailande: application à la préhistoire régionale In: Brugal, J and Desse, J eds. Petits Animaux et Sociétés Humaines. Antibes: APDCA. Auetrakulvit, P (2005). The Subsistence of Prehistoric Man During Late Pleistocene-Early Holocene in Southern Thailand In: Manavid, J and Pisnupong, P eds. Proceeding of the seminar on Thailand-Malaysia: Malay Peninsula Archaeology Programme. Bangkok: Samaphan Publishing, pp. 50–59. Auetrakulvit, P, Forestier, H, Khaokhiew, C and Zeitoun, V (2012). New Excavation at Moh Khiew Site (Southern Thailand) In: Tjoa-Bonatz, M, Reinecke, A and Bonatz, D eds. Crossing Borders: Selected Papers from the 13th International Conference of the European Association of Southeast Asian Archaeologists. Singapore: NUS Press, pp. 62–74. Bellwood, P (2007). Prehistory of the Indo-Malay Archipelago. 3rd Ed. Canberra: ANU E Press. Bronson, B and White, J (1992). Radiocarbon and Chronology in Southeast Asia In: Ehrich, R ed. Chronologies in Old World Archaeology. Chicago: University of Chicago Press, pp. 491–503. Bulbeck, F (2003). Hunter-Gatherer Occupation of the Malay Peninsula from the Ice Age to the Iron Age In: Mercader, J ed. Under the Canopy: The Archaeology of Tropical Rain Forests. New Brunswick: Rutgers University Press, pp. 119–160. Bulbeck, F (2014). The Chronometric Holocene Archaeological Record of The Southern Thai-Malay Peninsula. International Journal of Asia Pacific Studies 10(1): 111–162. Castillo, C and Fuller, D (2010). Still too Fragmentary and Dependent Upon Chance? Advances in the Study of Early Southeast Asian Archaeobotany In: Bellina, B, Bacus, E, Pryce, O and Christie, W eds. 50 Years of Archaeology in Southeast Asia: Essays in Honour of Ian Glover. London: River Books, pp. 91–111. Chaimanee, Y (1994). Mammalian Fauna from Archaeological Excavations at Moh Khiew Cave, Krabi Province and Sakai Cave, Trang Province, Southern Thailand In: Pookajorn, S ed. Final Report: The Hoabinhian Research Project of Thailand (Phase 2). Bangkok: Silpakorn University Press. Charoenwongsa, P (1987). Developments in Prehistoric Thai Archaeology. Man and Culture in Oceania 3: 79–89. Claassen, C (1998). Shells. Cambridge: Cambridge University Press. Conrad, C (). Ethnographic Analogy and the Archaeological Record of Northern Thailand: Insights from Mlabri Hunter-Gatherers and the Tham Lod Rockshelter Archaeofauna. Rian Thai: International Journal of Thai Studies, in press. Conrad, C, Van Vlack, H, Marwick, B, Thongcharoenchaikit, C, Shoocongdej, R and Chaisuwan, B (2013). Summary of vertebrate and molluscan assemblages excavated from late-Pleistocene and Holocene deposits at Khao Toh Chong Rockshelter, Krabi, Thailand. The Thailand Natural History Museum Journal 7(1): 11–21. Davidson, G (1994). Some Remarks on Vertebrate Remains form the Excavation At Gua Gunung Runtuh, Perak In: Majid, Z ed. The Excavations of Gua Gunung Runtuh and the Discovery of the Perak Man in Malaysia. Kula Lumpur: Department of Museums and Antiquity, pp. 141–148. Dunn, F L (1964). Excavations at Gua Kechil, Pahang. Journal of the Malaysian Branch of the Royal Asiatic Society 37(2): 87–124. Dunn, F L and Dunn, D F (1977). Maritime Adaptations and Exploitation of Marine Resources in Sundaic Southeast Asian Prehistory In: Bartstra, G, Casparie, WA and Glover, IC eds. Modern Quaternary Research in Southeast Asia. Rotterdam: A.A. Balkema, pp. 1–29. Francis, C (2008). A Field Guide to the Mammals of Thailand and South-East Asia. Bangkok: Asia Books. Gorman, C F (1971b). Prehistoric Research in Northern Thailand: A Cultural-Chronographic Sequence from the Late Pleistocene through to the Early Recent Period. Unpublished thesis (PhD). University of Hawaii. Gorman, C F (1972). Excavations at Spirit Cave, North Thailand: Some Interim Interpretations. Asian Perspectives 13: 79–107. Grayson, D K and Meltzer, D J (2002). Clovis Hunting and Large Mammal Extinction: A Critical Review of the Evidence. Journal of World Prehistory 16(4): 313–359. DOI: http://dx.doi.org/0892-7537/02/1200-0313/0. Groves, C and Taha, A (1985). Appendix 3: Notes on Gua Cha Mammals. The Re0Excavation of the Rockshelter of Gua Cha, Ulu Kelantan, West Malaysia. Federation Museums Journal 30: 98–100. van Heekeren, H (1961). A Preliminary Note on the Excavation of the Sai-Yok Rock-Shelter. Journal of the Siam Society 49(2): 99–108. van Heekeren, H (1962). A Brief Survey of the Sai-Yok Excavations, 1961–1962 Season of the Thai-Danish Prehistoric Expedition. Journal of the Siam Society 50(1): 15–18. van Heekeren, H and Knuth, E (1967). Archaeological Excavations in Thailand: Vol. I. Sai-Yok. Copenhagen: Munksgaard. Higham, C (1989). The Archaeology of Mainland Southeast Asia: From 10,000 B.C. to the Fall of Angkor. Cambridge: Cambridge University Press. Higham, C F W (1972). Initial model formation in terra incognita In: Clarke, D ed. Models in Archaeology. London: Methuen & Co. Ltd., pp. 453–477. Higham, C F W and Thosarat, R eds. (1998). The Excavation of Nong Nor a Prehistoric Site in Central Thailand. Oxford: Oxbow Books and University of Otago Studies in Prehistoric Anthropology no. 18. Kijngam, A (1990). Identification of Faunal Remains from Stratigraphic Units 5 and 6, Lang Rongrien Rockshelter, Thailand In: Anderson, D ed. Lang Rongrien Rockshelter: a Pleistocene, early Holocene archaeological site from Krabi, southwestern Thailand. Philadelphia: The University Museum. Köhler, F, Seddon, M, Bogan, A, Tu, D, Sri-Aroon, P and Allen, D (2012). Chapter 4: The status and distribution of freshwater molluscs of the Indo-Burma region In: Allen, D, Smith, K and Darwall, W The Status and Distribution of Freshwater Biodiversity in Indo-Burma. Cambridge: IUCN. Lekagul, B and McNeely, J (1977). The Mammals of Thailand. Bangkok: Association for the Conservation of Wildlife. Ludwig, J and Reynolds, J (1988). Statistical Ecology: A Primer on Methods and Computing. New York: John Wiley & Sons. Lyman, R L (). The History of MNI in North American Zooarchaeology. Paper Presented at the 79th Annual Meeting of the Society from American Archaeology. available from author. Marwick, B (2007). Approaches to Flaked Stone Artefact Archaeology in Thailand: A Historical Review. Silpakorn University International Journal 7: 49–88. Marwick, B, Shoocongdej, R, Thongcharoenchaikit, C, Chaisuwan, B, Khowkhiew, C and Kwak, S (2013). Hierarchies of engagement and understanding: Community engagement during archaeological excavations at Khao Toh Chong rockshelter, Krabi, Thailand In: O’Connor, S ed. Transcending the Culture-Nature Divide in Cultural Heritage: Views from the Asia-Pacific Region. Canberra: ANU E Press. Matthews, J (1966). A Review of the ‘Hoabinhian’ in Indo-China. Asian Perspectives 9: 86–95. Medway, L (1969). Excavations at Gua Kechil, Pahang III. Animal Remains. Journal of the Malaysian Branch of the Royal Asiatic Society 42(2): 197–205. Mudar, K (1996). Shoocongdej, R ed. Appendix F: Faunal Analysis – A Report on the Fauna from Lang Kamnan Cave, Thailand. Forager Mobility Organization in Seasonal Tropical Environments: A View from Lang Kamnan Cave, Western Thailand. Unpublished thesis (PhD). University of Michigan. Nagaoka, L (1994). Differential Recovery of Pacific Island Fish Remains: Evidence from the Moturakau Rockshelter, Aitutaki, Cook Islands. Asian Perspectives 33(1): 1–17. Pookajorn, S (1981). The Hoabinhian of Mainland Southeast Asia: New Data from the Recent Thai Excavation in the Ban Kao Area. Unpublished thesis (MS). University of Pennsylvania. Pookajorn, S (1984). The Hoabinhian of Mainland Southeast Asia: New Data from the Recent Thai Excavation in the Ban Kao Area. Bangkok: Thai Khadi Research Institute, Thammasat University. Paper No. 16. Pookajorn, S (1988). Archaeological Research of the Hoabinhian Culture or Technocomplex and its Comparison with Ethnoarchaeology of the Phi Tong Luang, a Hunter-Gatherer Group of Thailand. Tübingen: Archaeologica Venatoria. Pookajorn, S (1991). Preliminary report of excavations at Moh-Khiew Cave, Krabi province, Sakai Cave, Trang Province and Ethnoarchaeological research of hunter-gatherer group, socalled ‘Sakai’ or ‘Semang’ at Trang Province In: The Hoabinhian Research Project in Thailand Vol. 1. Bangkok: Silpakorn University Press. Quitmyer, I R (2004). What Kind of Data Are in the Back Dirt? An Experiment on the Influence of Screen Size on Optimal Data Recovery. Archaeofauna 13: 109–129. Reynolds, T E G (1990). The Hoabinhian: A Review In: Barnes, G ed. Bibliographic Reviews of Far Eastern Archaeology. Oxford: Oxbow Books, pp. 1–30. Reynolds, T E G (1992). Excavations at Banyan Valley Cave, Northern Thailand: A Report on the 1972 Season. Asian Perspectives 31(1): 77–97. Sathiamurthy, E and Voris, H K (2006). Maps of Holocene Sea Level Transgression and Submerged Lakes on the Sunda Shelf. The Natural History Journal of Chulalongkorn University 2: 1–44. Shoocongdej, R (1996b). Forager Mobility Organization in Seasonal Tropical Environments: A View from Lang Kamnan Cave, Western Thailand. Ann Arbor: UMI. Shoocongdej, R (2006). Bacus, E, Glover, I and Pigott, V eds. Late Pleistocene Activities at Tham Lod Rockshelter in Highland Pang Mapha, Mae Hong Son Province, Northwestern Thailand. Uncovering Southeast Asia’s Past: Selected Papers from the 10th International Conference of the European Association of Southeast Asian Archaeologists. : 22–37. Shoocongdej, R (2010). Subsistence-Settlement Organization During the Late Pleistocene-Early Holocene: The Case of Lang Kamnan Cave, Western Thailand In: Bellina, E, Bacus, E, Pryce, T and Christie, J eds. 50 Years of Archaeology in Southeast Asia: Essays in Honour of Ian Glover. London: River Books. Sieveking, G de G . (1954). Excavation at Gua Cha, Kelantan. Federation Museums Journal I–II: 75–138. Staniczenko, P P A, Kopp, J C and Allesina, S (2013). The ghost of nestedness in ecological networks. Nature Communications 4: 1391.DOI: https://doi.org/10.1038/ncomms2422 (2013) DOI: http://dx.doi.org/10.1038/ncomms2422. van Stein Callenfels, P (1936). Excavation of three Kitchen Middens at Guak Kepah, Province Wellesley, Straits Settlements. Bulletin of the Raffles Museum Series B.I: 27–37. Straus, L G (1990). Underground Archaeology: Perspectives on Caves and Rockshelters. Archaeological Method and Theory 2: 255–304. Tan, H (1997). The Hoabinhian and Before. Bulletin of the Indo-Pacific Prehistory Association 16(3): 35–41. Thirakhupt, K and van Dijk, P P (1994). Species Diversity and Conservation of Turtles of Western Thailand!. Natural History Bulletin of the Siam Society 42: 207–259. Van Vlack, H G (2014). Forager Subsistence Regimes in the Thai-Malay Peninsula: An Environmental Archaeological Case Study of Khao Toh Chong Rockshelter, Krabi, Available from ProQuest Dissertations & Theses A&I. (1622150080). Wattanapitaksakul, S (2006). Late Pleistocene Mammal Teeth from Tham Lod Rockshelter, Amphoe Pang Mapha, Changwat Mae Hong Son. Unpublished Masters Thesis. Department of Geology, Faculty of Science, Chulalongkorn University. White, J (2004). Comment on dates from a resin-coated sherd from Spirit Cave, Thailand. Antiquity 78(299): 184–187. White, J and Gorman, C (2004). Patterns in “Amorphous” Industries: The Hoabinhian Viewed through a Lithic Reduction Sequence In: Paz, V ed. Southeast Asian Archaeology: Wilhelm G. Solheim II Festschrift. Quezon City: University of Philippines Press, pp. 411–441. Zolkurnian, H (1998). Urutan kebudayaan prasejarah Lembah Lenggong, Hulu Perak, Perak pada zaman Holosen. Unpublished thesis (MA). Universiti Sains Malaysia. Zuraina, M, Haut, A and Ignatius, J (1998). Late-Pleistocene-Holocene Sites in Pahang: Excavations of Gua Sagu and Gua Tenggek. Malaysia Museums Journal 34: 65–115. Zuraina, M, Saidin, M, Chia, M and Zolkurnian, H (1994). Artifacts from the Gua Gunung Runtuh Excavation In: Zuraina, M ed. The Excavations of Gua Gunung Runtuh and the Discovery of the Perak Man in Malaysia. Kula Lumpur: Department of Museums and Antiquity, pp. 149–168.